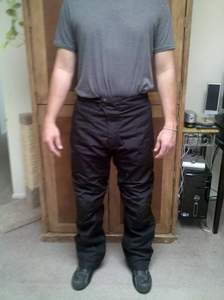 The Joe Rocket Ballistic 7.0 pants fit perfect. They are very comfortable and easy on and off with the full side zippers. In this pic I've got the Alpinestar Compression Shorts underneath. They too fit well but are on the tight side in the waste as it is not elastic. I'm a 34 waste and ordered the Large for both pants and shorts. They are the perfect combination for comfort and safety. Another great transaction from NewEnough.com - Thanks.